If you have to check luggage, you will have to pick it up in the baggage claim area, sometimes called the baggage reclaim area in some airports outside the US. No matter where you are in the world, you face the same kind of problems like the airline losing or damaging your bag or someone stealing your luggage. 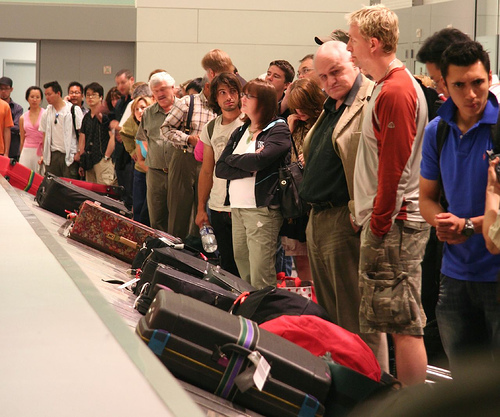 If you follow the tips below, you can avoid most baggage claim problems. 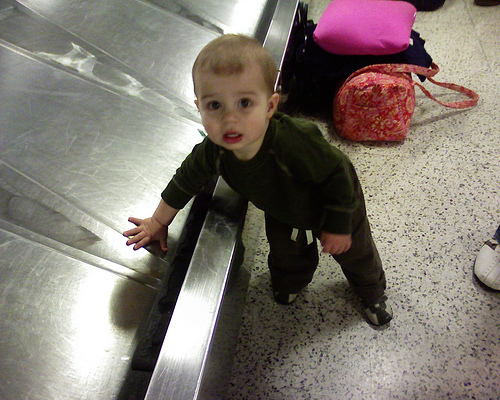 The easiest way to avoid baggage claim problems is to not have any checked bags. If you plan on checking two bags, and you find that you can travel with only one checked bag, than do so. If you can get by with just a carry-on bag, that would be an even better idea. In the US, most airlines allow you take one carry on bag, and one smaller item that can be placed under your seat. Also, there are many exceptions to carry on limits for things like baby strollers, medical devices, child seats. Many bags look alike, so do something to make it easy to find your bag quickly, like tying a bright ribbon to a handle or placing a decal on the side of your bag. If you have more than one bag, they may not be next to each other on the baggage carousel, so it is very important that each one of your bags have some kind of unique identifying features. Many bags come with a tag with a little address card. Put your name and contact information. If you put an address, put one where you want the bag to be delivered. You many want to also put a phone number or email address where you can be reached when you are traveling. You may want to put the same information inside the bag as well. 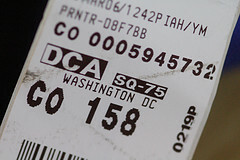 At the check in counter, when the airline puts their luggage tag on the bag, make sure that the information is correct. The most important information are the origin and destination airports, which are three-letter codes that will be in capital letters. If you don't know what they are for your departure and arrival airport, ask when you check in. Many tags will also have information about the flight number, and perhaps your name. Make sure that any identification number or other information on your bag's tag matches the information on your claim ticket. After your plane gets to the gate, make your way to the baggage claim area. If you are in an unfamiliar airport with a large baggage claim area, there may be many baggage carousels. 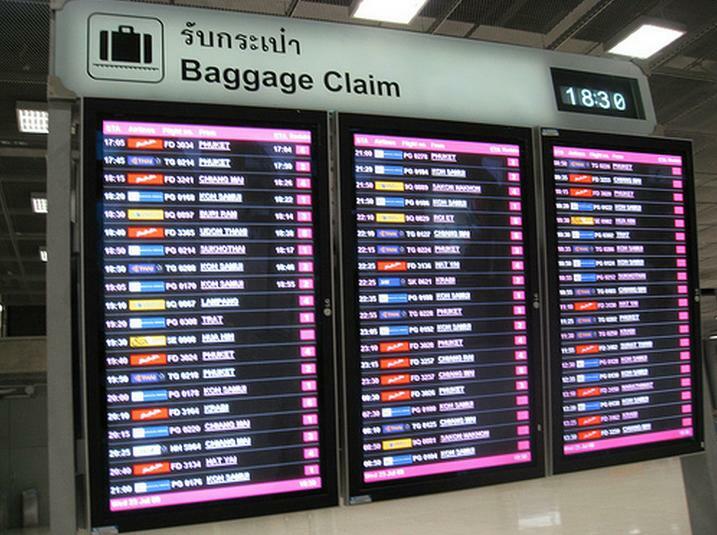 If you are not sure where to go, ask one of your airline's agents, or look for a baggage carousel board that lists which carousel will have your flight's bags. Even if you are the last person out out of a crowded plane, you should be able to get to the baggage claim area ahead of your bags. By the time the baggage carousel starts and bags start to come out, there will likely be a crowd of people looking for bags. Because the baggage claim area is not in the secure part of the terminal, you may have to deal with many other people besides the passengers on your flight, including potential theives. Don't be shy, get close to the carousel so you grab your bag the first time it comes by. If you get to the carousel before the bags arrive, it may not be moving, and it may be tempting to either sit and rest on the carousel or to let your child play on it. Don't do it. The machine can start at any time and without warning. The last thing you need to let a simple bag pickup turn into a medical emergency. After you collect all your bags, check the tags on your bags with your claim ticket. The information should match. If they don't check your bag more closely to make sure you picked up the wrong bag. If you did, put it back on the carousel. If you accidentally take someone else's bag away from the baggage claim area, you will be responsible for returning it either to the airline or the bag's owner. Also, check to see that the number of bags you have matches the number of claim tickets you have. At the end of a long flight, you may be tired and not thinking clearly, so count your bags before you go. Sometimes bad things happen to your checked luggage even if you take reasonable precautions. A little bit of preparation can make finding a lost or stolen bag or getting compensation for a lost or damaged bag much easier. A few things that you can do include keeping receipts from when you purchased your bag or the items in the bag, taking pictures of the bag or its contents, and either remembering or writing down details like the color and size of the bag, the brand name, and anything that would help identify your bag. While airlines won't compensate you for broken wheels, minor scratches, missing handles, or other things that they consider to be normal wear and tear, if you have major damage to your bag that you think was caused by the airline, report it to the airline as soon as possible. It is best to do it before you leave the airport. If you file a claim, make sure that you follow the airline's procedures for making claim for lost or damaged luggage. You should also keep copies of any complaints you submit.